He was born on February 19, 1888 in North Korea. He remained with his mother and younger sister after his father and brothers left for Hawaii. He came to San Francisco on March 29, 1914 to study in America. He reunited with his brothers nine years later. In 1919, he was active with the Korean National Association in Acron, Ohio and later with Kim, Jong-rim and Rho, Baik-lin in aviation school training in California. The school closed due to financial debts. He moved back to Chicago in 1945. After he settled in Chicago, Young- moon operated a restaurant. He was pragmatic and active man of character for coordinating and organizing skills. In 1946, Young-moon moved to Los Angeles and was actively involved in Hung Sa Dahn. He initially joined the organization in 1938 with membership #299 assisting Hahn, Si Dae. He had been a bachelor for many years until he met Ms. Park, Young-boke and tied the knot in Los Angeles. She is the younger sister of Park, Hee-do, one of 33 signatories of March First Declaration of Independence. Young-moon actively supported the Korean independence movement spanning from 1914 to 1945. In 2012, the South Korean government posthumously recognized he with the Order of Merit of National Foundation / Patriotic People Award for his self-less sacrifice or Korean independence movement until he passed away on April 11, 1968 in Los Angeles. He and his wife are buried in Rosedale Cemetery in Los Angeles, California. 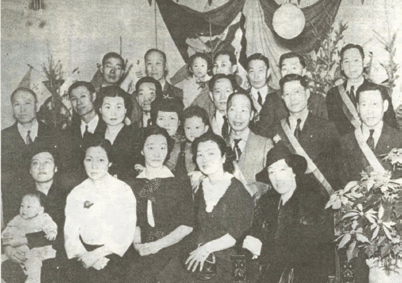 Hung Sa Dahn members at March First Ceremony in Chicago in 1930: Kang, Young-moon is seen second from right in the second row while his wife, Park (Kang) Young-boke is seated in front of him. 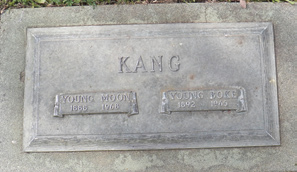 The epitaph reads KANG, Young-moon (1888-1968) and Young-bok(1892-1965) in Rosedale Cemetery in Los Angeles.